Climbing is the only cure for gravity… 1 day to go!!! With just few hours ahead to load all expedition material in a taxi and heading down to Dubai Airport Terminal 2, I feel very close the time when I’ll start receiving the cure for this disease that we climbers and paragliding pilots call Gravity. Khan Tengri can be climbed from either South or North Inylchek Glaciers, on which separate base camps are located. The “northern normal route” is more difficult than the “southern normal route”, but it is much less exposed to avalanches. It has eight different routes opened up to date, but we’ll be looking at climbing either Solomatov Route via the north east Chapaev Ridge, which take us to the summit via the West Ridge, or the Belkin Route going through the East Buttress to the North Ridge. Both routes are Russian Grade 5b and were first climbed in 1974 and 75 respectively. The route is to be chosen based on the conditions but most probably we’ll climb the first one which is considered the Normal Route. Not extremely steep glacier walk up. The last steep portion of the way is fixed with ropes. 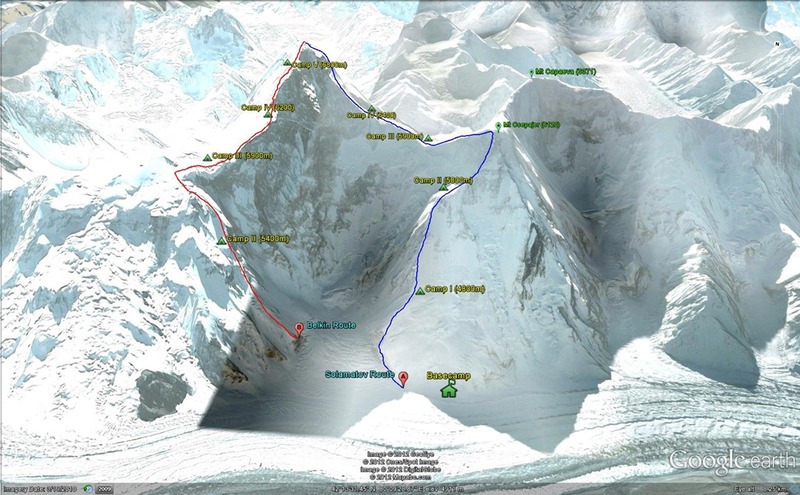 It is arguably a good idea to cross the crevassed glacier in the lower portion of the ascent using a rope, although most climbers cross this place without bothering to rope up. There is always an avalanche danger at this part. There are two possibilities to make Camp 1 – about one hundred altitude meters from one another. The upper ledge is smaller but somehow nicer. At both places there are enough dry rocky spots to make camping there pleasant. There is also an ice cave (enough for 3 people) near the upper ledge. This portion of the climb is fixed with ropes all the way. There are several very steep mixed sections, but the difficulty of the climbing is greatly reduced by the fixed ropes. There is no avalanche danger. There is no possibility to make a camp in between. Camp 2 is located at a large flat spot under Chapaev peak. Until the plato before the Chapaev peak the way is fixed with ropes. From this high point one needs to descend to the col between Khan Tengri and Chapaev. There are also some crevasses at this portion of the way, but most climbers don’t take a rope. There are several big snow caves at camp 3 so one doesn’t really need a tent. The fixed ropes end shortly before the summit. From this point on one needs to climb a snow ridge to reach the summit. The quality of the ropes is not as great as at the lower sections of the ascent. There is a possibility for camp 4 at a narrow ledge half way up to the summit from camp 3 at 6 400 m.